Doimo Cityline, specialized brands in furnishing for children, think about the needs of infants and mothers, with solutions to furnish the space of b & b at best: convertible cribs and cots, baby furniture and many beautiful and functional accessories, all made with high-quality materials and non-toxic paints, in compliance with the regulations europee.Le bedrooms Doimo Cityline Early Childhood is designed to accompany and pamper beb creating a serene and bright, individually in detail and made exclusively from fine textiles kit coordinated with the collections of beds and storage units. Choose Doimo Cityline means thinking about a place where to live better our child and accompany him at all stages of its development making him feel safe and protected from the first days of life, helping him to become great. 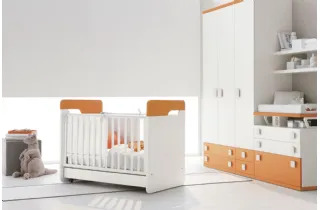 The bedrooms Doimo Cityline Early Childhood always create cozy atmospheres and reassuring for infants. Cots, so, become a nest in which to feel protected and rest in comfort possible. The safety of the child guaranteed by the materials and a sophisticated project at every stage. The collection of Early Childhood Doimo Cityline is enriched with the changing table. indispensable presence, classic and yet modern, to change the b & b with the maximum tranquility and also allow him to always feel at ease. 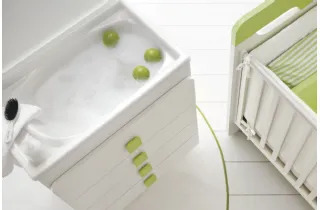 The changing table Doimo Cityline combined with practical com. The collection's rooms First Childhood created by Doimo Cityline also belongs baby bath, available in different versions that change according to the color, accessories and size. Common denominator a structure that allows you to reduce the time and ensures great comfort. The Doimo Cityline beds are an integral part of children's rooms Early Childhood, then coordinated with the other elements. The structure studied in every detail to combine comfort with unimmagine that communicates a sense of safety and security: essential because the serene children grow. refined and attractive design for convertible beds of Doimo Cityline, ideal proposal for modern times. Accompany the child from the first months up to about 15 years, based on a mechanism for everyone that guarantees maximum safety. The beds are part of different collections.